The Gift Edition offers all of the unique supplementary features available in Oxford's prayer books - The Revised Common Lectionary, historical and theological background materials, answers to commonly asked questions about the church, and more. All of this is bound in a beautifully-constructed cover - a perfect gift at an affordable price. Jesus is praying for this nation and He invites you to join Him! Recall an image of Jesus you've likely seen--Jesus, on His knees, praying. Imagine leaning in to listen to what He is praying and you hear Jesus speaking our nation's name. Experience Jesus' heart for our nation as you declare your freedom and passion to love the Lord, claim Bible promises for our nation's future, and intercede for spiritual awakening and growth. Guided prayer points for our nation's unity and leaders, along with prayers for spiritual awakening in the church and global gospel witness. Scriptures, prayers, and promises to declare over your nation. Do you ever sit down to pray and struggle to find the right words? You want to spend time with God, but you don't know where to begin? 365 Days of Prayer for Women is a beautiful book of topically arranged, guided prayers and complementary Scriptures that will enhance your prayer life and offer you peace, joy, and strength every day. God hears your voice when you direct it to him. He will step into every struggle and be your very present help in trouble. He will give you the words to say even when you find yourself lacking. "He is able also to save forever those who draw near to God through Him, since He always lives to make intercession for them." Prayer is a truly heart-warming passionate release of a desperate call to a daily communion with God the creator of all things. Prayer provides a railway line for the locomotive journey transporting God's heavenly blessings to an agonizing intercessor. From Genesis to Revelation, God is calling his children to intercession. All children of God, Jews and Gentiles, obedient and disobedient children are encouraged to come to God, in good times and in bad times. God is exposed as standing with an open arm patiently waiting for all to come home to God. So that God will be our God and we will all be his people. Prayer Communion guide book provides that opportunity for everyone to spend 40 Days 4o Nights of Prayer Communion with Almighty God. At the age of about 15yrs, Dr. Kabuin Thaddeus Kabere trusted the Lord Jesus Christ as his personal Lord and Savior from sin. Completely convicted by God's word in the Book of James 1:2 "Count it all joy my brethren when ye fall into divers temptations" (KJV) For the very first time he saw the need for a savior. During that Sunday morning service the teenage young man will not rest until he later kneeling by his dormitory bed side invited Jesus Christ into his heart for salvation. The next day (Monday) he stormed into the School Chaplains office, and the Chaplain prayed again with him, and send him off to the local Baptist Pastor's office to prepare for Baptism. After enquirers class the young man was baptized by immersion on the 24th of March 1984 at Ebenezer Baptist Church at the foot of Mt Fako; Buea. The young man grew up to become a youth Pastor, a Pastor, a Church Planter, and Missionary. Every Christian wants to be more like Jesusand, wonderfully, that's what God wants for us too: "It is God's will that you should be sanctified" (1 Thessalonians 4 v 3). How will that happen? Only by asking God to transform us from the inside outbecause real heart change comes not by our own willpower, but by the Spirit's power. Too often though our prayer lives are reduced to shopping-list-style-requests or desperate pleas to get through the day. But this little guide will help you to pray for genuine, deep and astonishing Christian growth, in your own life or somebody else's. These are prayers your heavenly Father loves to answerbecause they're based on his word. Each spread takes a passage of Scripture and suggests 5 things to pray for a particular area of your Christian life. Because when we pray in line with God's priorities as found in his word, our prayers are powerful and effective (James 5 v 16)and that's a truly thrilling prospect. Karl Barth's legendary image of preaching with the Bible in one hand and the newspaper in the other now has a matching image for praying. 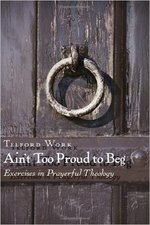 In Ain't Too Proud to Beg Telford Work encourages praying with a social documentary in one hand and the Lord's Prayer in the other. The result is neither a commentary on the Lord's Prayer nor a theology of prayer. Instead it is an exercise book that uses prayer to strengthen our theological muscles. Work proposes that we take whatever is happening in our world -- a political election or the latest war will do -- and set the Lord's Prayer in the middle of it. Let that prayer shed light on the scene and expose what matters. Then pray it. Then look again and see how the prayer is a response to what matters. These three movements give structure to the book as a whole and to each chapter within it. Prayed this way, the Lord's Prayer is always new and never quite the same. Ecumenical, evangelical, postmodern, and irenic in tone, Ain't Too Proud to Beg ends not with a neat scholarly wrap-up but with an open-ended -Amen- -- three sparkling, joyful sermons -- a fitting ending to Work's provocative exploration of prayer as a theological process. The task of praying for rulers and those in positions of authority isgiven particular importance in the New Testament. 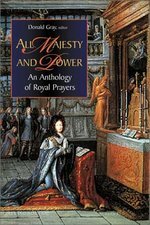 By gathering togetherexamples of royal prayer from throughout history, this uniqueanthology shows how this Christian duty is best accomplished. "All Majesty and Power presents for the first time in one place agreat range of royal prayers both ancient and modern. The book firstselects prayers that were used by the early Christians and accepted aspart of official church liturgy. The book then proceeds down the ages, collecting prayers in various styles until arriving at recent compositions, such as the coronation rite used in Westminster Abbey. Alongsidethese prayers for royalty is a unique compendium, stretching over onethousand years, of prayers actually written and prayed "by kings andqueens, including, most recently, a text by the Duke of Edinburgh. Including an original historical (sometimes curious and occasionallyhumorous) introduction by Donald Gray, this volume displays afascinating slice of Christian spirituality through the centuries. 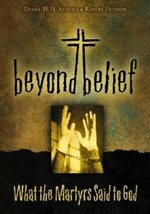 Offers a collection of powerful Scripture readings and prayers. This book guides readers, in the most intimate way possible, before God's throne of grace ...so that they expand the horizons of their prayers as they pour out their praises, confessions, and thanksgiving to the Lord. There is but one king that I know. It is he whom I love and worship. If I were to be killed a thousand times for my loyalty to him, I would still be his servant. Christ is on my lips, Christ is in my heart; no amount of suffering will take him from me.--Genesius of Rome These are more than lofty words. They are a reflection of ultimate faith spoken by a person staring death in the face. Like a flaming torch, they illuminate for us the reality the martyrs saw, the truth that gripped their hearts and lifted their eyes to heaven in the face of fire, sword, and executioner's axe. biographies of sixty Christians who died for their faith, from Stephen, the church's first martyr, to Bahram Dehqani-Tafti of Iran, who was shot to death in 1981. In today's age of uncertainty, spiritual pluralism, and self-indulgence, the words of the martyrs remind us of the worthiness of Jesus and the costliness of the gospel. They humble us with their commitment. 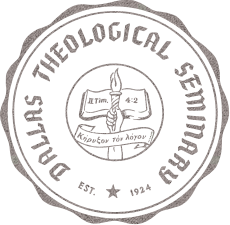 They fortify our faith with their honesty and certitude. And they direct our vision toward eternal realities that far outshine anything this world has to offer.